It's actually quite an honor... we won't get to see much of the show from out front, because we're offstage in a green room until our segment comes up, but it's pretty overwhelming how much is going on. We did get to see the whole thing at rehearsal a couple times though... there's like 60 people in this thing, people running everywhere. Everybody, especially the stage crew been really cool to us throughout rehearsals... and the dancers are genuinely appreciative too, they even bring the band out with them for curtain calls. Another buddy of mine is going to cover "Ties" for Bluegrass Today, so pictures to follow. Break a leg, not a string. Have fun, I did a pit band gig once and I long to do it again. An absolute thrilling, terrifying, exciting, nail biting and ultimately satisfying experience for me. A good friend of mine lives in Roanoke; I'll let him know about it. I used to love doing pit gigs. When I was much younger - in the 70s and 80s - I particularly loved the fact that the books were ordered from a New York publishing house and were rented - so you got scores that had markings and erasures from the previous players, sometimes New York players, some of whom were real monsters. And it was fun! Even in a well rehearsed show you never knew what would happen next - cossack dancers overshooting and landing in the orchestra, the tympani player's glasses falling off onto the drums in the middle of a quiet patch - just lovely stuff! Have a great time with this gig. The pit band is a real brother-and-sisterhood for the duration of the show. My Congratulations on this GIG ! Thanks fellas... it was an absolute BLAST! Definitely in my top-ten all-time favorite gigs ever. Playing in pit orchestras has been one of the great joys of my life. You get to play in an ensemble that isn't the focus of the audience's attention. That's tremendously liberating, especially if you're actually in an orchestra pit, where they can't even see you. It might sound weird to someone who's never done it, but it's just like recording in a studio, because you can concentrate 100% of your attention on the music - except you're doing it live, in front of an audience. I don't know of any other circumstances like that, except perhaps cathedral organists or circus bands, where nobody is expected to "put on a show." I play any production I can, from community theater to experimental stuff at colleges (though I've only done that twice. The first was a novel in itself, here are the plot points: billionaire Brown University alumni/playwright, + pretentious NYC Sondheim wannabe with a fetish for bizarre time signatures, + 30 or so coeds running around in diaphanous Ancient Greek-meets-the Ramones gowns while guys howl gibberish at them. It was the 80s), I don't care. They're my favorite people. Plus, the music is great. Because I accidentally learned classical music on string bass before I discovered how hard it is, I caught the wave of productions of "Jesus Christ Superstar" when everybody was doing it. And it is one killer libretto. Andrew Lloyd Weber's has a funky bass player trapped in his brain, let me tell you. You'd think "Godspell" would be really loose and happy, wouldn't you? Judging by what's going on onstage, with giggling hippie/clowns chasing each other around (I like the Simpsons version, "Up With Everything!") and the positive message of inspiration, you'd think the charts would glow on the stand or something. Well, I'm here to testify that they're not. Every single note is written, with copious suggestions for dynamics in obscure Italian along the way. Worst, it was written by a pianist. (You can always tell.) I played in four productions, including a six-week run at the Dorothy Chandler Pavilion in Hollywood. I have a real love/hate thing going on with that score. Love the play, though. The best part is that you have a conductor doing all your thinking for you. You never have a (sober) guy standin' in front of you at a bar gig, waving a stick and nodding when it's your turn to play, do ya? Yet isn't that precisely what's required most? I love bands like Hot Rize and pre-Botox "Barbie" Krauss because they gathered around a single mic. (Hot Rize even traveled with their own soundman for that one mic - usually an AKG 414). The reason that's such a monumental step is because it changes the most basic aspect of playing in an ensemble: dynamics. If you've ever done it - or watched it - you can see (and more importantly hear) how the true masters can vary their volume without moving an inch. The only way I can put it is that the musicians aren't playing, they're being played. Playing in pit orchestras is like that, to me. It tightens your musician mojo like nothing else, seriously. It gets rid of the distractions (namely, people looking at you) and allows you to absolutely master an evening's worth of music. Thanks to the conductor, you don't even have to tap your own foot! The only downside is that in general, they don't allow barbecue. I'm so happy for you. I envy anybody who gets to have that much fun. I said two little words (one of which was "it") and decided to tell you about the greatest drummer I ever played with, who was also in the pit orchestra for what he called "Jesus H. Superstar." He had grown up in some little town in Florida where circus people overwinter and had taken lessons from a circus drummer, then played with circus bands for years. The reason I'm telling you about him is because of the most remarkable demonstration of skill with drums that I've ever seen. If you think about it, drummers in circuses do mostly "press-rolls" and flams. He had such precise control of his sticks, his press-roll was as smooth and slick as stroking a long cat. One day during rehearsal, a few of us were gathered around his kit chatting when he said; "hey! Watch this!" and began playing a press-roll that was smooth as silk. He brought it down to a whisper, and as cleanly as the slightest breeze to your cheek, to utter silence. He was still playing, though. We were all staring at the tips of his sticks, which hadn't changed whatsoever. They were actually stopping a nanometer above the head or something. I don't think one of us remembered to breathe. And then, again at the slightest whisper we began to hear it again, flawless, as it rose in volume to some kind of finish. I was pole axed. Just stunned. I went to a drum clinic years ago with the drummer for John Cougar Melloncamp (sp?) doing the clinic. He spent a couple hours doing amazing things, like playing two completely different beats with different times at once and stuff like that. When was finished with all the amazing flash he turned to the audience and asked them, "Do you know why I am a first call L.A. studio drummer, playing for all the best in the industry?" beats (boom chuck, boom boom chuck). He stopped and said, "It's because I can play this beat better than anyone else." Funny as all get out, and he was not kidding. You could hear that something extra in his simple playing, even on that simple drum beat. 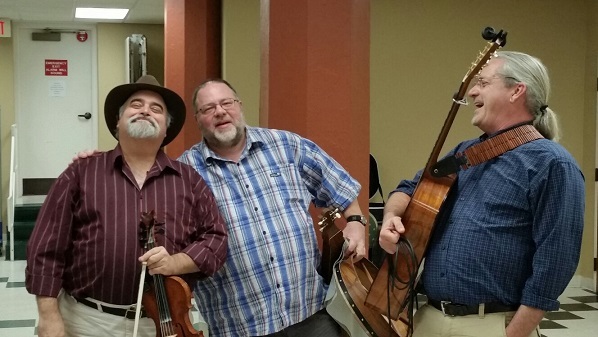 Post-game and some pictures from the Bluegrass Orchestra in the stage production of �TIES�. I had an incredible time doing this show� last time we did it was like 7 or 8 years ago with the original cast on opening night, and was limited to just a one-off role, The show just used our soundtrack for everything else from then on. This time the plan was to have a much larger band than before, and to put us in the orchestra pit of the Jefferson Center for Performing Arts. http://www.jeffcenter.org/ Jefferson Center is a beautiful venue throughout� used to be an old High School in downtown Roanoke. 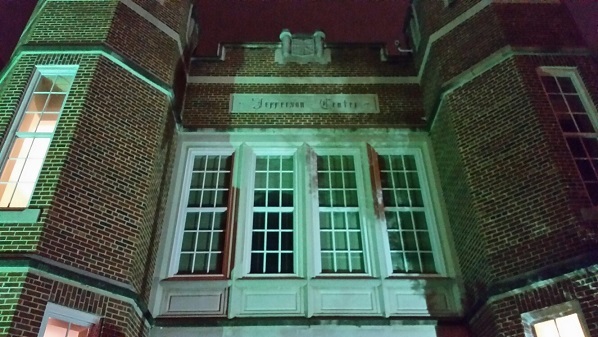 Here�s the spooky Gothic front doors, and a view of the Auditorium from center stage. For starters, the Director decided instead of us being in the orchestra pit, to make us seem more a part of the cast, and have us actually perform on-stage *with* the dancers, which was a logistical NIGHTMARE, but the stage crew made it happen. They set up a rolling platform with all our mics, and gear loaded on it in very specific order. Deal was, there�s an exactly 20-second total blackout at the end of the scene right before we go on� -I mean you can�t see your hand in front of your face- during that time, they roll our stage out, lock it in place, set the mics on marks, set my amp and three other direct boxes, then bound out of our path so we can hit our marks before the lights go up. 20 seconds is not a long time folks. It goes by even faster in pitch black. Thank goodness, to help our eyes adjust, they put us in a dark hallway in the wings off stage-right for 5 minutes before we went on. 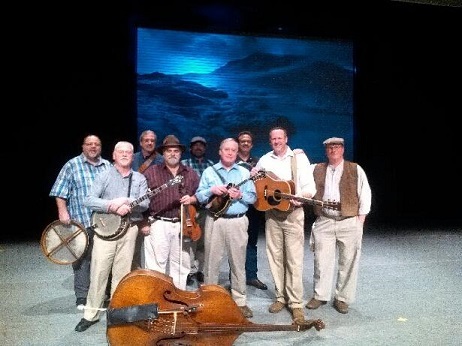 For another thing, bluegrass and oldtyme string bands just don�t operate the same way as an orchestra does. 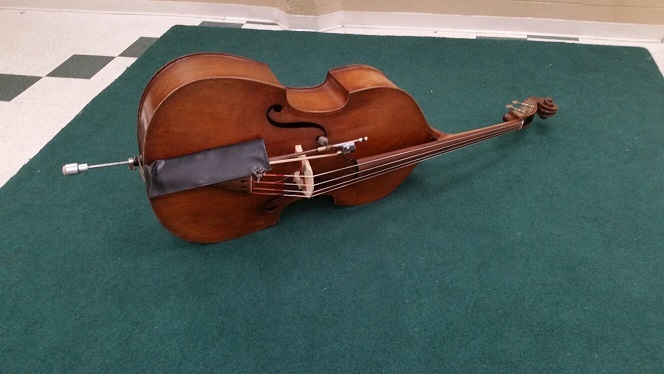 Having two or more basses is madness, and you really don�t want to hear what a banjo section sounds like. (trust me � I�ve been in line behind 400 of them at fiddler�s conventions) Anyway, what we did was combine two bands and divide up tasks to cut down on redundancies. 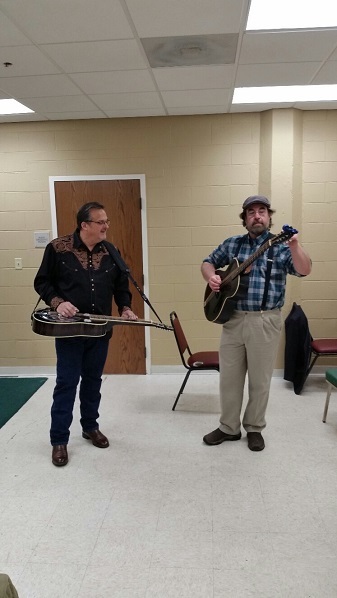 The other bass player (a *true* bassist I should say) opted to sing harmony parts and just play a different instrument not commonly found in a string band � a mandocello. There are two guitarists, but one of them was strictly playing leads and fills, while the other is playing rhythm to accompany lead vocals. The rest of the instrumentation was; fiddle, banjo, mandolin, and resonator guitar. We also had a utility guy playing dulcimer, harmonica, and even a bahran. (Irish drum) One of the aforementioned stage-hands took this fuzzy picture of us right after soundcheck. 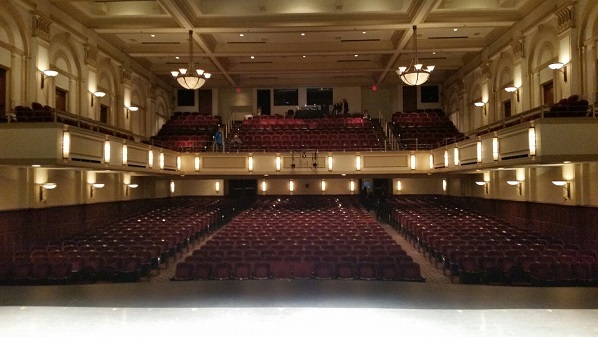 Another of the fun perks to this gig was the accommodations� Jefferson Center has a vast area underneath the stage with dressing rooms, lockers, a kitchen, and a huge green room with a private entrance and exit for the musicians. This was where we spent most of our time during the shows... it had speakers so we could listen for cues. 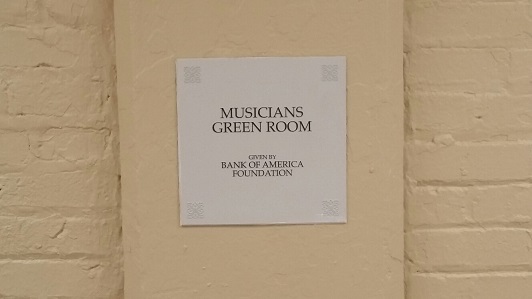 The green room even had green carpet for my bass! 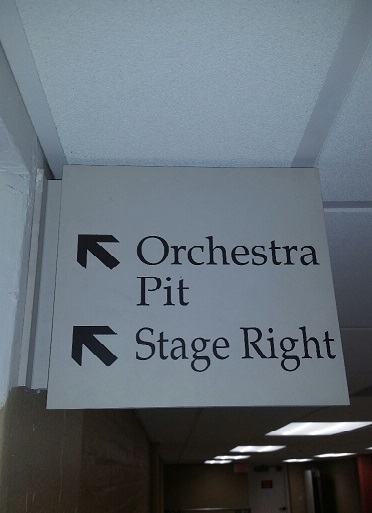 In the maze of corridors down-stage, these directions were helpful. 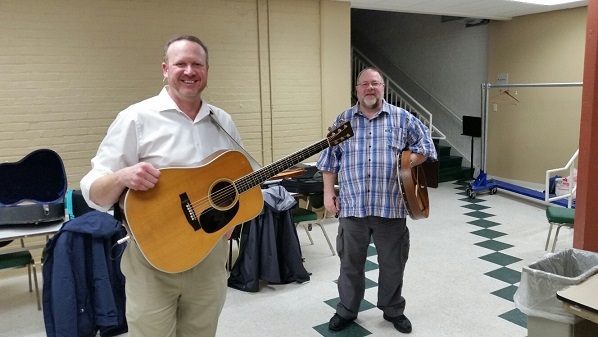 David Austin on guitar/lead vox, and Keith Wood on dulcimer, harmonica, and percussion. 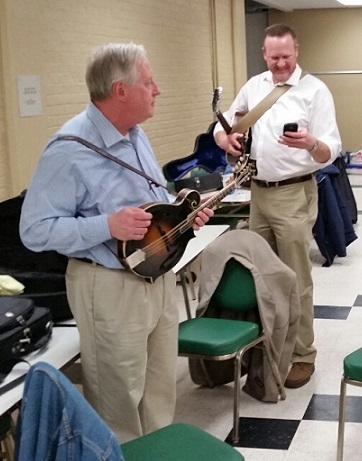 Curt Baker on resonator guitar, and John McBroom on mandocello. 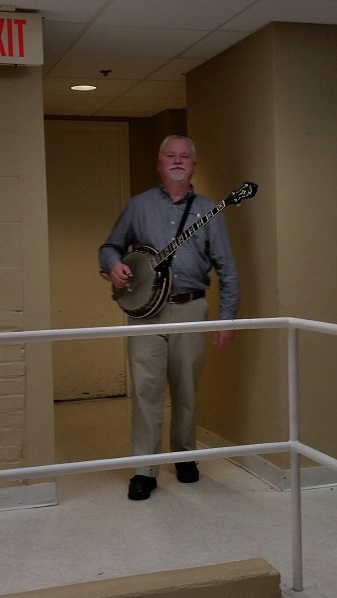 Tim Rhodes on banjo. Looks like he�s attempting to tune it this time. Again, what a BLAST! It was sad to load out �TIES-2016�, but the Waffle House was calling, and I had a bar gig on Sunday afternoon. I just saw a great program about what pirates were really like, and they pointed out that many captains wore an eyepatch, flipped up. They would flip it down over their eye a few minutes before going belowdecks, and when they flipped it open again down there, they could see in the darkness with that eye! This is all so wonderful ! I too am happy for you . 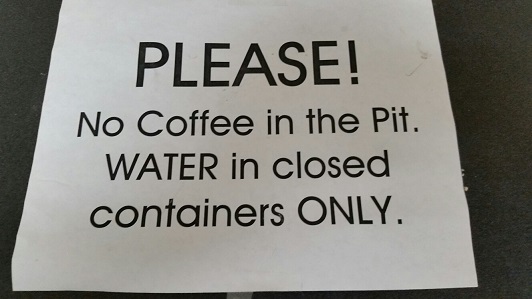 I love playing pits, but they have a tendency to consume a lot of time. I thought I had retired, but apparently not. I am planning on playing my 104th pit for a community theatre production of Seussical this summer. It will be the second time I have played this show. JC Superstar was perhaps the hardest score I�ve played (Phantom of the Opera is a very close second). For a very interesting take on this show, check out the 20th Anniversary version. (http://www.amazon.com/Jesus-Christ-Superstar-Anniversary-Recording/dp/B000003FD5/ref=sr_1_21?s=music&ie=UTF8&qid=1457446499&sr=1-21&keywords=jesus+christ+superstar). If I ever play this show again, I will steal heavily from this version. Regarding Godspell and playing all the notes on the page exactly as written: I think I�ve done that show 4 times, it�s a lot of fun, especially if you have decent guitar player. I don�t think I�ve ever played it exactly as written (or exactly the same way twice). The only shows I�ve played _exactly_ as written are Sondheim and Bernstein shows, and even then there�s been some flexibility, especially during scene change music. My favorite shows have been local high school productions where my stepson was in the cast (or in the pit � that was stressful, it was a struggle to get him ready to leave for rehearsal when I was ready to go). Also, I was fortunate enough to sub for the national touring company of Les Miserables. Sight reading that show is intense. It�s the scariest thing I�ve ever done, and I�ve been skydiving. I played for a production of Cabaret where the drum set was on top of the piano, and the pit musicians were in drag (the script mentions an all-girl orchestra). If your sight reading chops are decent (and cuts are well marked), most of the �classic� shows are not too bad. I was able to sight read shows like King and I and Fiddler On The Roof. If it�s Sondheim or Andrew Lloyd Webber, get the book in advance and make sure you can play all of the nasty bits (Phantom: a song in 15/16? Really? Are you angry at the musicians? I can�t really hear that missing 16th note on the case album). I�ve taken to using post-it notes to mark all cuts and notes. It takes no time at the end of a show to clean up my book (go to a community theatre production on closing night. I�ll bet you can see pit members erasing their parts in between songs). Ok, if I ever plan on complaining about a difficult gig, I will surely remember that guy who had to dress in drag to play his drumkit atop a piano while sight reading, for everyone to see!!! Wow! I'll bet that was a once-in-a-lifetime spectacle! I can't imagine it. Not the drums on piano or the guy in a dress (I was born in the SF Bay Area and grew up in southern California, so that wouldn't even surprise me), but a drummer sight reading? Now that would be something to see! The keyboard player in my band " Easy Wind" is also a percissionist and plays the "The Vibes " , he actually has a degree in music and sight reads very well as well as drum notation and knows all the drum rudiments ! He is a High School music teacher. I read but love to improvise using concepts of classical counterpoint along the way . These are rare animals which cannot be easily spotted in the wild But there are some. I am friends with a wonderful drummer (Although have had not the chance to play together again for a few years, unfortunately!). He's one of these guys from around here who, in the late 70s-early 80s had the chance to travel to the US to study music there and was an alumnus of the Drummers Collective, knew and learned a lot from Mr. Kenwood Dennard himself, is an orchestral percussionist and yes, is not only a fantastic drummer, but also a very skillful sight reader.